Mort Künstler Hand Signed and Numbered Limited Edition Print and Canvas:"Pickett’s Charge"
Edition Size: Artist Signed and Numbered with COA to 350 prints with 50 AP's. Canvas limited to 50/50/15/5. Image Dimensions: Limited Edition Print Image size: 14.5" x 29" / Overall size: 19.5" x 33" Canvas Sizes: 14" x 28", 17" x 34" , 22" x 44" and 29" x 58". About the Edition : The 150th Anniversary of the Battle at Gettysburg Release marks the 2nd of 8 final releases from Mort Künstler and his impending retirement to coincide with the end of the civil war on April 9th, 2015. About the Art : As one of the most decisive engagements in one of the most renowned battles, the tragic assault known as Pickett's Charge, still resonates 150 years later. After several unsuccessful attempts to envelop Federal forces by striking the Union left flank at the Peach Orchard, Wheatfield, Devil's Den and the Round Tops and then attacking the Union right flank at Culp's and East Cemetery Hill, General Robert E. Lee concentrated his remaining strength of artillery and infantry at the center of the Union lines. 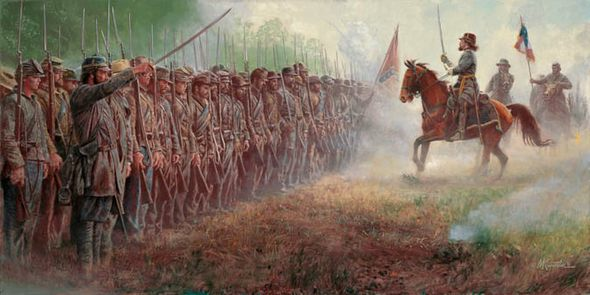 Despite the initial hesitation from his senior commander, Lt. General James Longstreet, Lee remained steadfast in his tactical plan, which called for nearly 12,000 men (nine brigades) to march over 1,000 yards across open ground. His confidence in the infantry's ability to reach the enemy was bolstered by the plan to precede the initial charge with a concentrated cannonade focused at the Union center. Although Longstreet's corps artillery chief, Colonel Edward Porter Alexander, had effective command of the field, there was an insufficient concentration of Confederate fire on the objective. The brunt of the assault was borne by the infantry troops, who were required to march into the oncoming fray of Federal artillery and musket fire with virtually no available cover. Ironically, the term "charge" used to describe the attack is an overstatement, as the rebel troops marched deliberately in a line across the open plain, accelerating only when they were within a few hundred yards of the enemy. This line consisted of troops under the commands of Major General Isaac R. Trimble, Major General George E. Pickett and Brigadier General J. Johnston Pettigrew and it stretched out for more than a mile. The majority would never reach their intended target, a copse of trees defended by troops under the command of General Winfield S. Hancock. Prior to the assault, General Pickett gallantly addressed his troops as they waited in the hot July sun, lined up in ranks along the tree line adjacent to the field. Despite the arduous task that lay before him, Pickett appeared to be in very high spirits and his confidence was infectious. Riding up and down the line, he shouted to his men that they were all Virginians and to remember what they were fighting for. With that encouragement, Pickett's men courageously stepped off into what would become one of the most fateful engagements in American military history. Suffering incredible losses, more than half of Pickett's division was killed, wounded, or captured, including all three of his brigadier generals. The following day, Lee began to withdraw and to move his army south toward the Potomac River, thus concluding the Battle of Gettysburg. The procession of wounded and receding troops stretched out for more than fourteen miles. Many Southerners later came to believe that Pickett's Charge represented the "High Water Mark" of Confederate hopes for independence.